Large music collections are not easy to manage. If you have a few thousands of audio files, you may want to keep them more or less organized. Otherwise it becomes almost impossible to know what is inside those music folders. mp3Tag Pro is a smart tag processor with professional features and intuitive interface. It can easily fill out missing ID3 tag fields (title, artist, album, year, genre, comments etc.) using parts of filenames and folder names. If the required information is not there at all (for example, your files have filenames like track01.mp3 and no tags), mp3Tag Pro can download ID3 tags from internet services, like Amazon and FreeDB. You can export existing tags for a backup or for further processing, and import ID3 tags from a database through a CSV file. mp3Tag Pro will also let you easily organize your collection by creating new folders and sorting music files into them according to the pattern that you specify. Imagine that you have a chaotic structure of subfolders in your music folder. Provided the files are properly tagged, you can create a new structure just in a few clicks and sort thousands of files at once. Using information from ID3 tags, mp3Tag Pro will make folders for every genre, artist, album, and so on, depending on your choice. Files will be sorted into the corresponding folders. The program is also capable of downloading lyrics and album art for any selected group of files. The downloaded lyrics and cover art can be saved in ID3 tags inside the files, or as separate files. mp3Tag Pro supports tags in MP3, WMA, OGG, WAV, FLAC, APE, WV, M4A, AAC, MPC files. All files are processed in the same way and don't need to be separated. You may work with all supported formats at once. Get full control over ID3 tags and organize your music collection with mp3Tag Pro! AudioConverter Studio 6.0 - Audio Converter and CD Ripper in one. mp3towma, wmatomp3, mp32wav, wavtomp3. Free M4a to MP3 Converter 6.0 - Free M4A/M4B/AAC to MP3/WAV conversion software with excellent functionality! Media Catalog Studio Lite 5.9 - Too many music and video files or CDs? Organize them with Media Catalog Studio! MP3 Recorder Studio 5.9 - An excellent application for hassle-free sound recording from multiple sources! 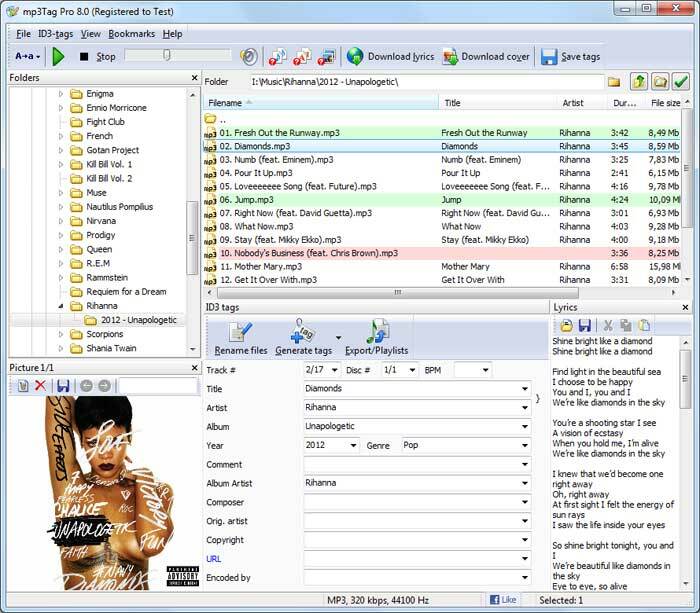 mp3Tag 5.91 - Music M4a WMA MPC OGG APE MP3 tag editor and organizer with extended features. Visual MP3 Splitter & Joiner 6.0 - WAV MP3 Cutter & WAV MP3 Joiner in one. Join, combine and split MP3,WAV quickly.